Following on from the success of the Band’s recently held PipeBand-A-Thon, the Band’s next fundraising venture will break new ground being aimed squarely at the Band’s female supporters – introducing Pamper for Piping to be held on Friday 28 April at 7.30pm: Included in the ticket price is a free pamper session (get your hair or nails done or a nice massage or hand wax), a small meal and some demonstrations including a talk on posture by Lesley Mitchell. A good night out to spend with the girls away from the men!! Tickets are on sale NOW from band members and can also be obtained via the Band’s email address and the Band’s Facebook page, where you can message us for tickets. 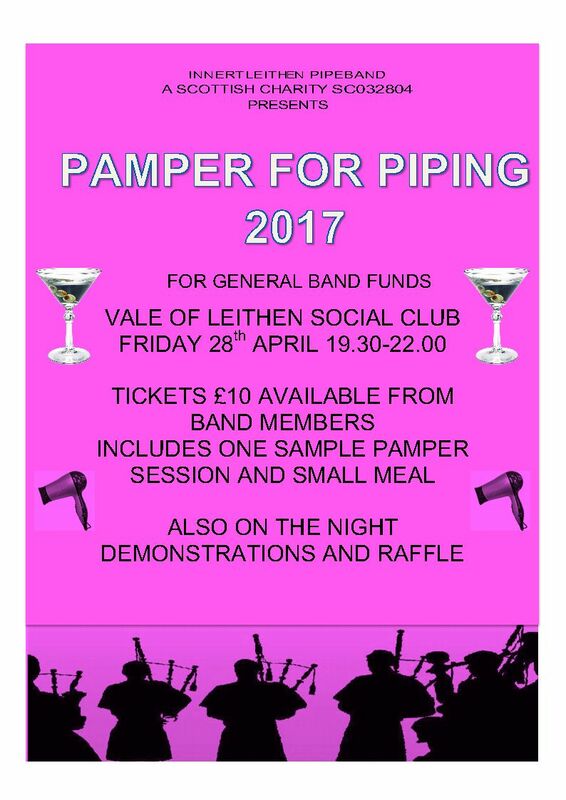 Please support your local Pipe Band- we look forward to seeing you on the night.